The Dodge Dakota is a midsize pickup truck available with two cab configurations: a five-passenger Extended Cab with rear-hinged doors and a Crew Cab with four conventional doors with room for up to six passengers. The Dodge Dakota is manufactured in Warren, Mich. alongside the Dodge Ram. Main competition to the Dakota include the Toyota Tacoma, Chevrolet Colorado and Nissan Frontier. Since its introduction in 1987, the Dodge Dakota has always stood out from the crowd. The first ‘mid-size’ pickup in a sea of compacts, Dodge equipped the Dakota with full-size power in the form of a V-8 engine to optimize its towing and hauling capacity. Over time, the other domestic automakers began to increase the size of their trucks until most of them had caught up to the Dakota – at least in terms of dimensions. Dodge completely redesigned the Dakota in 2005 with added power and passenger space, but the Dakota got its current look due to a mid-cycle enhancement in 2008. The 2008 Dakota is still based on the same platform as the Durango sport-utility vehicle, which was derived from the full-size Ram pickup. What this means for buyers is that the Dakota maintains its crown as the largest mid-size truck on the market. The extra size can be felt across the board in terms of increased cargo capacity and a larger, roomier interior. The Dakota has simplified the ordering process somewhat by whittling the number of body styles down to two: the extended cab and the crew cab. This means that all Dakotas accommodate at least 4 passengers with optional 5 passenger seating. There are also only two engines available in the pickup. The first is a 3.7 liter V6 which generates an acceptable 210 horsepower and 235 lb-ft of torque. A more potent 302 horsepower, 329 lb-ft 4.7 liter V8 is standard on the higher trim levels of the Dakota, and remains the only V8 available in its class, at least until Chevrolet gets into the 8-cylinder mid-size game within the next few years. V6 engines get a choice of either a 4-speed automatic or 6-speed manual, while the 4.7 liter is equipped exclusively with a 5-speed automatic. As with most pickups, the Dakota can be outfitted with 4-wheel drive. There are 7 different trim levels that can be ordered for the Dakota – the ST, SXT, Big Horne / Lone Star, SLT, TRX4, Sport and Laramie. These trims are arranged so as to accommodate buyers who are searching for a simple, barebones work truck, a capable off-road machine or a fully equipped boulevard cruiser. At the top of the model range, the Laramie provides a comprehensive equipment list which transforms the interior of the truck into a comfortable place to spend long-distance trips. The TRX adds trail-ready equipment such as off-road tires and tow hooks, while the Sport trim installs seats that are better at gripping the driver during high speed cornering – although strangely, it also adds the automatic transmission. The V8 engine almost matches the V6 in fuel economy with a rating of 15 miles per gallon in the city and 21 miles per gallon on the highway for the 4-wheel drive version of the truck. There really isn’t any real reason to forgo ordering the 8-cylinder power plant in the Dakota, especially considering the improvement in drivability and towing capacity that it imparts – up to 7,000 lbs. The Dodge Dakota continues to make a strong case for why it is the leader in the field of mid-size trucks – a market it created some 20 years ago. 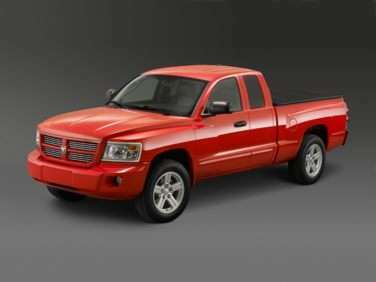 The 2009 Dodge Dakota has very little improvements over the previous year because the 2008 model had a makeover from previous years. For 2009 the trim levels were reorganized and four of them got eliminated. Some standard equipment has changed also along with discontinuing the all wheel drive option. The trim levels offered for 2009 are ST, Big Horn (known as Lone Star in Texas), TRX4 and Laramie. These trims are available in extended cab and crew cab body styles. One bed size is offered for all trims. The ST comes standard with 16-inch wheels, a CD player, tilt steering and cloth upholstery. The Big Horn (and Lone Star) trim level gets 17-inch wheels, full power accessories, center console, cruise control, body-colored bumpers, rear folding seats in the extended cab model and a rear under-seat storage system for crew cab models. Options for the Big Horn trim level include sliding rear window, full-swing rear doors, satellite radio, leather wrapped steering wheel with audio controls, power front seats and utility bed rails. The TRX4 trim level includes all of those options as standard equipment. This level also includes off-road tires mounted on 16-inch alloy wheels, trip computer, anti-slip differential and front seats with side bolsters. The top of the line trim level, the Laramie, includes these features plus chrome exterior trim, a bed liner, automatic headlights and 18-inch alloy wheels. Leather upholstery is available in the Laramie trim only. In 2009, the Dakota no longer corners the market with the only mid-size truck with a V8 engine. This year Chevy and GMC have both fitted V8 engines inside the Colorado and Canyon. Even so, the 2009 Dakota remains the best-in-class for maximum towing capacity with a capacity of 7,100 pounds. But this may be one of the only pros setting the Dakota apart from the others in the class. Choices like the Canyon, Colorado, Honda Ridgeline, Nissan Frontier and the Toyota Tacoma get better gas mileage, have more standard features, more available options and are available at a lower MSRP than the Dakota.